In order to understand the architecture of the MAIPN network, it is helpful to start at a familiar place. In a typical office, computers (and these days, telephones, security cameras, etc.) 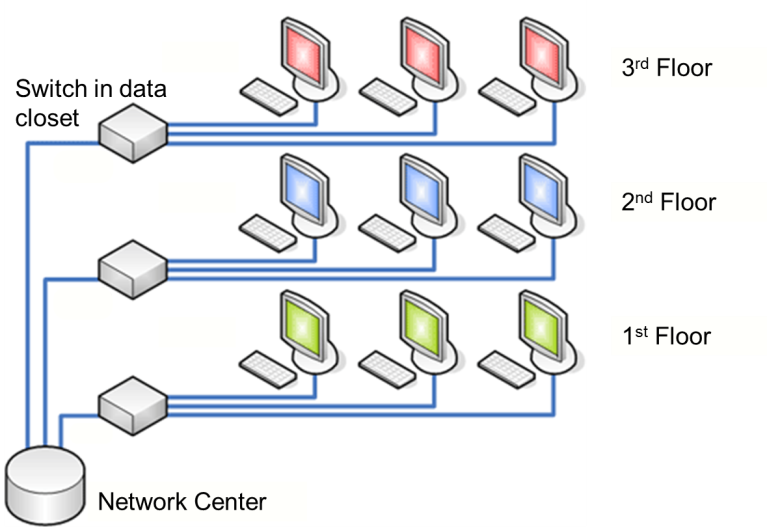 are plugged into network switches in a data closet, as shown in Figure 1. The switches are connected to other switches by network cables or fiber-optic cables. At some point, these cables lead back to a network center, where more computers are connected to more network switches. Specialized computers in the network center, called servers, run the key shared software applications used by the business, including email, telephone and teleconferencing services, databases, file storage, and firewalls connected to the Internet. The network switches and the cables that link them together, which most end-users never see because they are hidden away behind locked doors, form the backbone of the typical office Local Area Network, or LAN. Some LAN operators also connect Wi-Fi access points to their network backbone. This enables end-users to wirelessly connect to the network through a nearby wireless access point. Now suppose you want to extend your LAN to a building on the other side of town. You could lease bandwidth on your telephone or Internet service provider’s fiber-optic network, or even string your own long fiber-optic cable between your two buildings. Having provided a broadband data link between the switches at those two (or more) disparate locations, you have created something called a Metropolitan Area Network, or MAN. End-users in those different locations can then share the resources of the network, just as if they were all in the same building. The Mid-Atlantic IP Network is essentially a Metropolitan Area Network, just like the one described above, comprised of geographically separated network switches joined by point-to-point links. But there is one important difference. 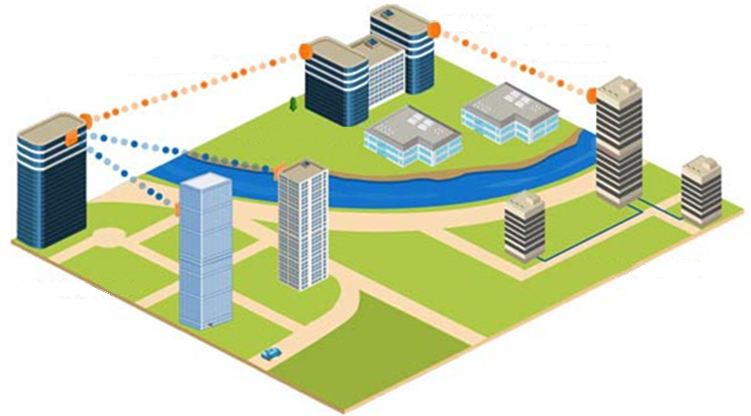 Instead of the broadband data links between switches being implemented using fiber-optic cables, they are implemented using pairs of microwave radios. Each pair of radios functions as a virtual fiber-optic cable, providing high-speed two-way data communications between the network switches located at either end of the link. While the Metropolitan Area Network in Figure 2 spans just a few block, the link distances in practice can be much longer, as long as there is a clear, unobstructed path between the two radios. Figure 3 shows a Ubiquiti Nanobeam Model M5. For just $67, you get a self-contained digital microwave radio integrated with a 25 dBi dish antenna that is about 16 inches in diameter. A pair of these units, pointed toward each other over a clear line-of-sight path, can sustain a data rate of 450 Mb/s over a distance of up to 5 miles. The only connection to this radio is a standard CAT-5 Ethernet cable. (If you use the dish outside, you need a weatherproof cable.) The radio is powered by a 24 VDC power supply over the same cable that carries the data. When a pair of these radios are connected to standard network switches at either end of the microwave link, it is exactly as though the switches were connected by a gigabit-class Ethernet cable. A site that has two or more of these units is termed a network backbone node. As with the local area network shown in Figure 1, is the these interconnected network switches that form the network backbone, albeit with microwave radios rather than fiber-optic cables providing the links. MAIPN more commonly uses the setup shown in Figure 4. 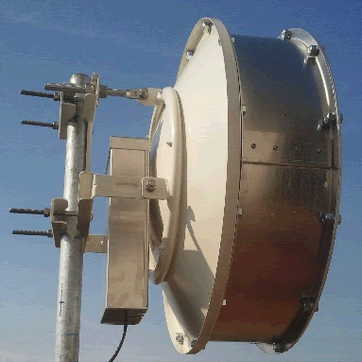 This slightly larger dish, about 26 inches in diameter, provides 30 dBi in gain. 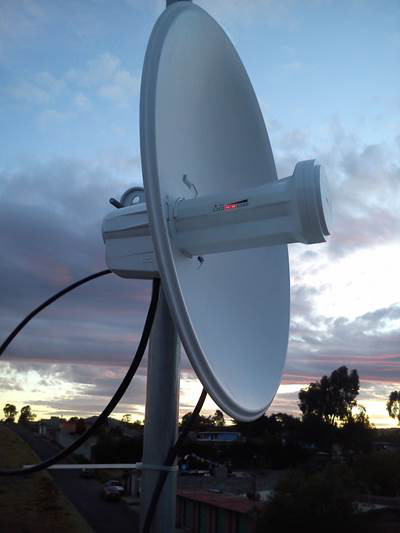 The radio is supplied separately and attached to the back of the dish during installation, but is completely compatible electrically and functionally with the NanoBeam M5 radio. The setup shown here also includes aluminum shields that improve the performance of the radio, especially at sites that have other radios in close proximity. 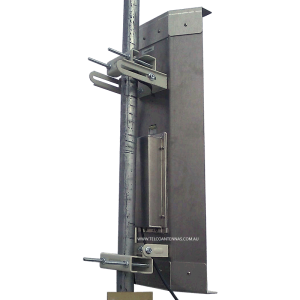 As you can see, this system is physically much more robust than the NanoBeam and is well-suited for permanent installation at the top of tall towers or in other remote locations. This configuration, exclusive of the mounting structure but including lightning protection and cabling, retails for about $500. We have one pair of these radios operating over a link path of 53 miles, although with reduced throughput. This link traverses open farmland between Gambrill Mountain near Frederick, MD and a tower on a hill overlooking Red Lion, PA. Ideally, these units would be better suited for link paths of less than 25 miles to achieve the full specified throughput of 450 Mb/s. Last but not least, MAIPN employs sector antennas. 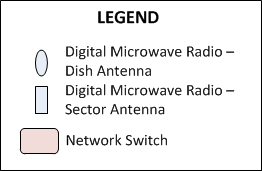 Figure 5 shows a sector antenna that uses the same radio as the dish shown in Figure 4. Unlike a dish, which concentrates the radio signal into a very narrow beam, a sector antenna spreads the signal out over a wider area – anywhere from 45 to 120 degrees beamwidth, depending on the model selected. Sector antenna are useful to permit one radio to connect to two or more distant sites that are in the same general direction. However, there are several tradeoffs. First, the throughput for any one radio is 450 Mb/s, so if more than one site is linked, the bandwidth is shared between those sites. In many cases, that is an acceptable compromise. In addition, because the signal from a sector antenna is spread over a relatively wide area, the gain is lower and the maximum link distance is correspondingly shorter. Last but not least, the wider beamwidth is subject to interference from a larger swath of territory. Nevertheless, link distances of five to ten miles are commonly achieved. The switches that form the backbone of the Metropolitan Area Network are sometimes called routers. Technically, there is a subtle difference between a network switch and a router, but that distinction is primarily of interest to network engineers. Switches and routers are both intended to steer information to the desired destination; routers have additional specialized software that enables them to find the best path to take. End-users can think of routers and switches as equivalent in terms of their role in the network and use the terms interchangeably. In Figure 6, we see four backbone nodes, each having microwave links to two or more distant backbone nodes. Two of the backbone nodes are on unattended radio towers, while the third and fourth nodes are located on tall buildings. End-users such as hospitals government agencies may connect to any backbone node via a dish or sector antenna, and local users at the location of a backbone node may connect to the backbone switch using standard network cabling. Click here for Part 2 — What is MAIPN good for?